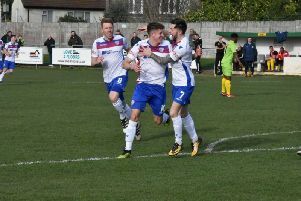 Steve Kinniburgh knows his Corby Town team will have to be at their best if they are to keep the pressure on at the top end of the Evo-Stik League South Division One Central this weekend. The Steelmen are unbeaten in their last six matches, five of which have been wins, as they bid to stay in touch with leaders Peterborough Sports. Corby were denied the chance to move into second place after their midweek clash at Welwyn Garden City was postponed just 45 minutes before kick-off due to snow. They remain a point behind second-placed Bromsgrove Sporting with two games in hand and five adrift of the table-toppers. Corby will be looking to make it six home wins in a row when they return to Steel Park this weekend. But Kinniburgh is staying cautious as they take on a Bedford Town team who he feels are “underachieving” in the league. The Eagles, who reached the second round of the Buildbase FA Trophy before being knocked out by Vanarama National League side Chesterfield, currently sit in ninth place having been among the pre-season favourites for the title. And Kinnniburgh said: “It’s going to be a tough one, we took a point from the game down there and that was a hard night for us. “With the game being off on Tuesday, it means the boys will have a bit extra in the legs now. “It’s one of these games where we have to make sure we are completely focused. “We are going up against a team who, in my opinion, are underachieving in the league. They had a great run in the FA Trophy which, no doubt, had an effect on things. “But they are out of that now and I would imagine they will pick up and finish the season well. Kinniburgh and his players, meanwhile, were left disappointed following that midweek postponement at Welwyn Garden City. “We arrived just before 6.30pm and obviously the snow was quite heavy and the referee said at the time that the visibility of the lines was his biggest concern, which I could understand,” he said. “But there was no attempt by anybody to clear the pitch and if there had been an effort to get the snow off then it would have looked better. “We just wanted the opportunity to go out and warm up and then see how it was. To be honest, you could clear the snow quite easily with your feet and the surface was fine underfoot.